When it comes to classic Swedish death metal (aka, the “Sunlight” sound), everyone talks about Entombed, Dismember and Carnage. And rightly so, these bands and their classic albums are foundational to the development of the death metal genre. But more people need to recognize Grave. Additionally, more people need to recognize 1992’s You’ll Never See as a classic death metal album. 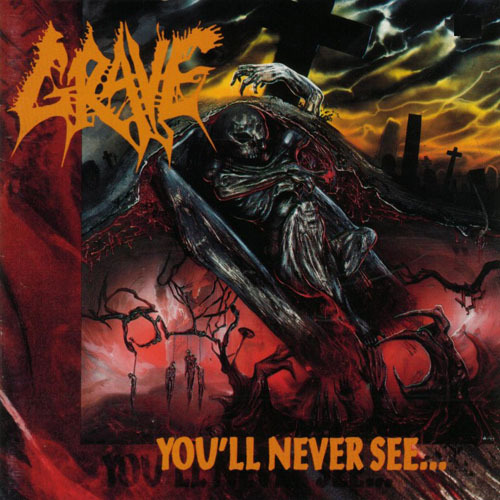 In 1992, Grave continued on their deadly path with You’ll Never See, again displaying relentless death metal that strengthened their position as one of Sweden’s leading bands. Grave’s second album sounds a lot cleaner than their debut, but most of the brutality is intact. The guitars are meaty as hell, and Jorgen’s vocals are incredibly deep and powerful. He was definitely one of the best singers in the scene at this time. The song structures were a little less brutal, with more slow parts. All in all, this was a very good album, though it couldn’t match the band’s relentless debut. And that last line is where I disagree with Ekeroth. Into the Grave is a fun, gruesome death metal romp. But You’ll Never See is more developed, powerful and better-written than its predecessor. In fact, Ekeroth quotes Ola Lindgren to that effect (emphasis my own): “We were starting to mature at this point, and the songs were more thought through.” A listen to the title track should make that clear enough. The song isn’t written like something off of Left Hand Path or Dark Recollections, opting for a fuller, grander sound. The song shows a great mix of fast and slow parts, the haunting chorus declaring to the listener: “Take my hand and walk with me until the end, You will never see heaven.” Death metal at its best is not a contest to see who can make the most disgusting content ever: it’s about instilling a feeling of horror and dread through the effective use of themes like annihilation and despair. And while I see the value of a raw, primitive sound like that on Into the Grave, You’ll Never See is a great example of how a cleaner, bigger sound can add to the power of a death metal album. The HM-2 buzzsaw sound is great, but there’s no harm in beefing it up. As with other classics like Pierced from Within, None so Vile and Slaughter of the Soul, the album is a towering orchestra of fury and destruction, due to both the songwriting execution and the picture-perfect production.